When you think of some of the flowered wonders that exist on this earth with all their luscious appearances and perfumes, lavender and geranium are probably, on reflection, not the prettiest – I almost think of them more as herbs. Hardy, very English, pleasantly scented potted-plants to grace my doorstep and balcony, yes, but for me, more like loved and trusted medicines. Both are olfactory essences that I have long been in alliance with in terms of their aromatherapeutic use: the stern, health-giving and rigorously beautiful scent of lavender; the rosaceous, pungent, glorious life-force that is geranium essential oil. I would not be able to count the number of bottles I have bought and used over the years, to be honest: for baths, skin creams, throat gargles; insect bites, as antiseptics, to sprinkle on the pillow at night as a natural, calming remedy to help me sleep. I also like lavender perfumes, although I don’t really wear them all that often. Duncan is from Norfolk, source of the finest English lavender fields (we even went on a lavender tour there, and I am not ashamed to say that I did shed a tear when I saw the distiller drip its first drop of pure essential oil into the container bottle, as great bales of freshly harvested lavender were put into the machinery). He seems to be naturally drawn to the scent, and his mother also often sends me bunches of lavender that she has picked and dried from her garden (and which I also hung up in my hospital room during this stay – thanks Daphne x ). Serge Lutens’ Gris Clair (which, perhaps scandalously, I doctored with some high-altitude Mexican lavender essential oil to make it even more lavendered); Guerlain’s sharp, dandyish and violet-heavy Lavande Velours, and Penhaligons’ suaver than suave Sartorial are all lavender scents that smell fantastic on him – elegant, understated, intriguing, and fresh. The lavenders I have worn myself are more vanillic, or else almost nothing but lavender: Caron’s Pour Un Homme and Les Plus Belles Lavandes De Caron with their sensual undertones of vanilla and amber come to mind: Gaultier’s husky mint-musked lavender Le Mâle, Yardley’s English Lavender – which is beautifully simple and almost grave in its traditional Englishness, and, even better, and by far my absolute favourite, the lesser known, but utterly delightful Lavande Royale by Roger & Gallet, which has a compelling, flinty nutmeg note in its heart, alongside the refreshing cologne-like citrus top notes and more balsamic, benzoin-laced base. This latter scent has some points in common with Diptyque’s new Eau De Lavande from ‘Les Florales’, a recently introduced range that includes the nicely done, if unthrilling, Eau De Rose, and Eau Moheli, a bright, twisty, and interesting take on the ylang ylang tree that I couldn’t help buying last year as a wake-up, oceanic, summer work scent. Call me style over substance, but I must say upfront that I just love the packaging of these perfumes, to the extent that I think I would buy them merely to be able to look at the bottles and boxes on the dresser (stupid though that probably sounds): the Geranium Odorata, with that clever little red, softly indented, band, the pleasureably ergonomic smooths of the bottle; the hypnotically pure, classical botanical prints embossed all over the white box…. it all really does strike me as an especially gorgeous design, and must say that I like the lavender one as well, with its Arcadian fountain, its flow of lavender springing eternally from the sage, Hellenic wells of antiquity. The perfume inside is also quite nice, again with a nutmeg note ( a smell I adore), as well as cinnamon, coriander, and a warm, if somewhat drab, woody base. It veers towards the masculine side of things, and is quite sensual for a lavender perfume; a bristling, fresh lavender scent with an immediate, commercial hook that I can imagine making it quite successful, but it is a little dun, and ‘sportively understated’, for my own more purist, lavendrial tastes. Comparatively, geranium is a far less common star player in perfumery, even though it is a fundamental ingredient, along with lavender, in the classic, familiar, gentlemanly fougère composition. Geranium essential oil is one of the strongest aromas that exist, so pungent and diffusive that a few drops in the bath will fill up the whole house with lung, brain, and hormone-secreting fullness. This vital, voluminous strength of odour speaks of its power: the geranium is one of the hardiest of plants, surviving in all kinds of conditions and temperatures, able to just live on and on and keep doing what it does best: BLOOM. I don’t do anything with the geranium plants we have upstairs on the balcony, and I am constantly amazed by their ability to flower in despite of adversity: in frost, in the scorching Japanese summer, the bright red flowers show no sign of ever being cowed by their surroundings, and this is probably why the essence is so valued in aromatherapy; it truly is revitalizing. It is also too harsh for most people as a perfume centerpiece: bright, sharp, almost cat-pissy. Frederic Malle’s Geranium Pour Monsieur did a fairly good job, I thought, with restraining the essence, dousing it, and putting it in a novel, fresh and minty context that made for a new take on masculinity, although I personally preferred Miller Harris’ excellent Geranium Bourbon, a Spanish-influenced geranium number that is piquant, unusual and intense, with its notes of cassis, palmarosa (another essential oil I love), rose and black pepper over a sultry patchouli and ambered base. There is nothing else quite like it, a strong and soulful flamenco geranium that, strangely, doesn’t seem to garner much attention. The solid perfume format, dense, thick and intense, is especially appealing. Geranium Odorata is full of far less dramatic gestures, but what is good about it is the beautiful sense of balance that the perfume achieves. The geranium note (composed of two different geranium essences plus bergamot and pink pepper) is rosy, and blatantly geranium-ish, prominent, but, intertwined with a subtle, fresh tobacco note, cedarwood, tonka bean and Haitian vetiver, it avoids the raucous, minty green that the pure, unadulterated essential oil has. Instead it is mild, fresh, with a pleasing, and energizing, benevolence. Although I know I am certainly swayed by the packaging, I think I would like to own this scent in any case as a balancer; a re-equilibrizing post-shower scent when I can’t think what else to wear. 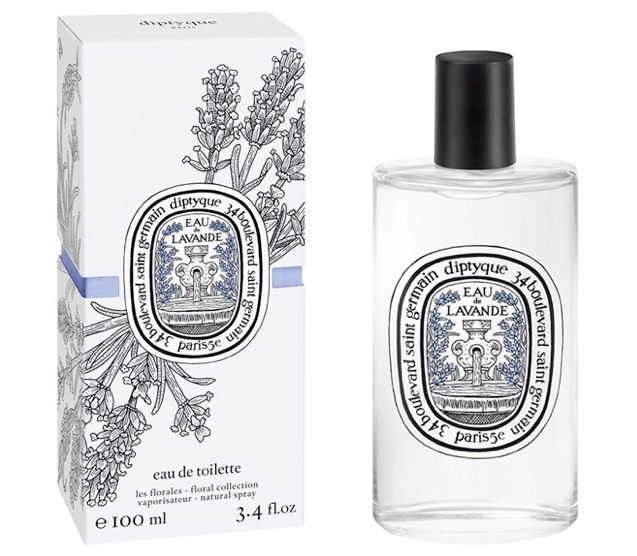 There has been some criticism of Diptyque on some perfume fora for playing it a bit too safe with Les Florales. When you think of some of the more uncompromising and striking perfumes in their past portfolio – the bizarre green basil of Virgilio, the sweaty armpit stench of the cumin-heavy, curried L’Autre, and the ghostly incense of the beautiful Vinaigre De Toilette, then I suppose these recent releases do come across as rather conservative. At the same time, what’s good about them is the lack of nonciness: flowers these days have to always be made demure, pink, and florabotanical ( I loathe all the modern. ‘feminine’ ‘roses’ that fill the department stores). In the Diptyque series they have a more brazen, vivid appeal, like the flowers themselves, reaching up in some June garden drinking in the sunshine and spreading their vibrant roots in the earth. For me, while none of the scents in the range have the clarity and sense-rushing lift of the very finest floral fragrances – there remains, at heart, something a tiny bit staid; safe, even chemical with the essential natural framework – at the same time there is an ease, a pleasantness and simplicity that I find I am rather drawn to. After reading this review, I need to try both of these fragrances. But…..I thought I had given the lavender an iffy review! It is quite nice, though, even if the geranium is better for me personally. Easy. Light. Fresh. And thanks for the compliment. It is a lovely sunny day, I feel in a good mood and clear-headed, and wanted to post something brisk. Me too, somehow, but I know your nose will find them lacking. The geranium, though……something clean and quite pleasing about it. There’s nothing stupid about your being drawn the packaging and wanting to look at the bottles and boxes of scent on a dresser. You’re creating vignettes that are little slices of beauty. And being a person who craves beauty, I understand that a passing glance at that dresser tableau can sometimes make your whole day. Yeah your right, I guess it sounds a little stupid. I agree the packaging is beautiful, especially the Eau de Lavande. I do love nutmeg in perfume, but still I fear these releases are probably not for me. Now, if they made as much effort with the packaging of lotions and shower gels AND decided to release these two, I’d be more than interested. I know what you mean, actually. An exquisite geranium shower gel could be just the ticket. Hurrah for floral perfumes that are allowed to smell like flowers again. It seems to one Dandy that modern botanical scents, like contemporary ‘good looks’ have become a parody, a grotesque extravagance of artificial beauty in the name of over perfection. For all those ‘feminine roses’ see all the identikit feminine noses, the result of some surgeon’s knife, through which they are smelt. Even Kourai were allowed their flaws, the grain of the marble the indent of the sculptures tool. In our airbrush, photoshop world nothing is real unless it is itself, but more so. I agree. Although these two Diptyques are hardly masterpieces, there is an element of rawness in them that definitely appeals. I smelt them, they are not masterpieces, but then one doesn’t want to look at a Titian every day. Sometimes a mere Renoir will do. Renoir is far too gaudy for my tastes, but I can’t think of a suitable art reference in retort. More like illustrations from a garden book. Yet more to add to the ‘must sniff’ list.! I’ve been using both in essential oil form for years, being two scents that make me feel utterly blissful. However, I bought some (startlingly green) lavender absolute from a wholesaler here in the UK and it’s changed the smell of lavender for me forever. I can’t go back. In fact it’s so multi-faceted that it’s an entire perfume in itself. It has a distinct whiff of the lavender that exists in Penhaligon’s Douro, in that it’s quite mossy and musky. I’ve always got a strong dilution (just in perfumer’s alcohol) with me. It’s my emotional rescue as well as a perfume. And with that divine sounding concoction, you don’t even need to go NEAR the Dipytyque for fear of pollution in comparison. I, also, like it pure. Just the oil, a really good oil. Yes, I think I agree about the lavender. But I think I’d just use the word ‘cheap’ in relation to its ending. The geranium was better, but I found it a bit too… mono-dimensional, maybe? Definitely. Most definitely. But the tester papers have been drying down quite humanly in the house the last couple of days, and I can definitely see the D in the geranium. It lacks, but it gives, if you know what I mean. It sounds lovely. 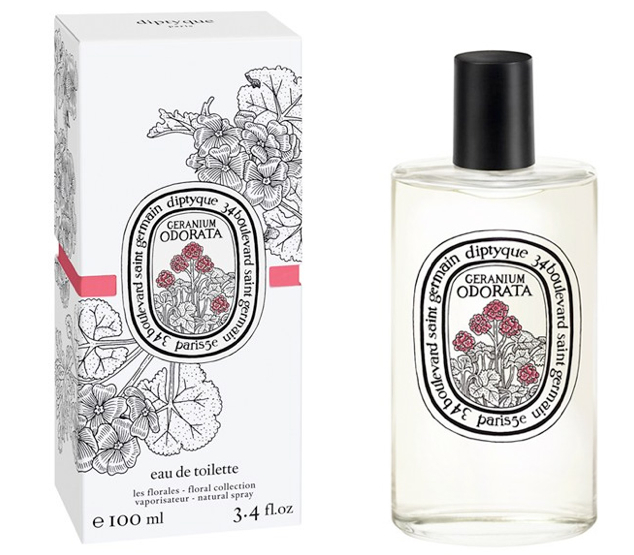 Is it similar to Ombre Dans L’Eau or an actually, full rose de Bulgarie? No, not as sharp as L’Ombre Dans. Definitely a true Bulgarian Rose. It’s very pretty.